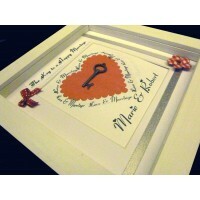 A gorgeous, simple new baby gift, this word-art frame is a perfect way to say 'Hello' to a new arrival. 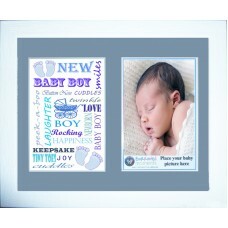 The print is printed with quality acid-free inks on archive paper to ensure that it will not fade away and the recipient just needs to add a favourite photo to finish off this simple keepsake, a lovely way to mark a new baby arrival, simply add your own photo to the photo space and display, can be hung on a wall. The frame glass size is 10"x8" (254mm x 204mm) and the white-washed solid wooden frame can be hung on a wall or stood on a desk or sideboard, the printed word-art area is approx. 6"x4" (152mm x 101mm) and therefore the photo space is also this same size, perfect to fit a standard sized photograph in, a perfect way to capture a moment in time to treasure forever. This item will come wrapped as a pretty gift, ready to be given as a present to someone else or just as a special treat for yourself, you may also wish to add our extra gift-wrap service, where the gift will also be presented in a wrapped gift box, if you would like this option, don't forget to add it via the drop down box. Simply choose from a Pink or Blue finish and select it from the drop-down box. Perfect for Nana, Grandma, Grannies, Nanny and Noonoo's everywhere! A gorgeous, quality print to sho.. This is a stunningly beautiful word art, personalised keepsake in light or dark Blue; or in light or..
A simple, but stunning keepsake for a lovely wedding gift, these unique art pieces make a wonderful,..